If you live in North America, there’s a one in two chances that the medicine that you use is distributed by hidden giants McKesson (MCK US, MV $44.4bn) and AmerisourceBergen (ABC US, MV $17.4bn). This Asian wide-moat company is the McKesson of its home country as the #1 private pharmaceutical wholesaler. For the business model of a pharmaceutical wholesaler-distributor, working capital management is critical. In terms of inventory management efficiency, at the inventory turnover period of 42 days, the company is nearly twice as efficient as state-linked giants and is nearly on par with world leaders McKesson and AmerisourceBergen, an impressive feat given the logistics challenge in emerging markets. The company’s 9.6% ROA is nearly double that of state-linked leader. In an economy where business fortunes are built from government concessions or licenses, the company has forged a different path by relying on its own capabilities to provide quality pharmaceutical products and healthcare largely in the private sector. Dr K, the chairman and CEO, and his management team have exercised prudence and discipline in executing their operations and capex plans with a strong balance sheet fortified by net cash that’s around 10.5% of market value while deepening their core competencies in warehousing, logistics, sales and marketing to connect to the fragmented market of over 4,000 clients. Public healthcare services in Asia face the problem of social and financial sustainability. The cost of medicare is pushed higher and higher, driving more and more people who cannot afford such healthcare into crowded public hospitals. Doctors get paid so well in private healthcare that public hospitals cannot afford to attract and hire the best. There is growing demand for reasonably-priced quality private healthcare services, generic drugs and consumer healthcare products of which the company is a key provider and beneficiary. Our latest monthly issue for the month of September investigates an Asian-listed company who is the #1 private pharmaceutical wholesaler and also one of the largest private sector manufacturer of off-patent medicines in its domestic market. Its integrated business model from pharma manufacturing to wholesale, distribution and marketing has carved out top-selling own-branded products such as #1 in medicated powder, #1 cough mixture, #1 cough expectorant etc. With its network of warehouses strategically located throughout the country, the company is able to provide comprehensive coverage and rapid access to markets and customers, delivering the “Medicines on Call” value proposition to over 4,000 private-sector customers from private hospitals, pharmacies to supermarkets and also serves as the long-term channel partner to international brands such as GSK, J&J, 3M, Colgate Palmolive, Nestle for over 30 years etc. From FY2014 onwards, the company has operationalized the business to contract manufacture orthopedic components for top MNCs with the full array of machining, casting, coating and forging capabilities. In an economy where fortunes are built from government concessions or licenses, the company has forged a different path by relying on its own capabilities to provide quality pharmaceutical products and healthcare services largely in the private sector. In an economy where fortunes are built from government concessions or licenses, the company has forged a different path by relying on its own capabilities to provide quality pharmaceutical products and healthcare. Dr K, the chairman and CEO, and his management team have exercised prudence and discipline in executing their operations and capex plans with a strong balance sheet fortified by net cash that’s around 10.5% of market value while deepening their core competencies in warehousing, logistics, sales and marketing to connect to the fragmented market of over 4,000 clients. For the business model of a pharmaceutical wholesaler-distributor, working capital management is critical. In terms of inventory management efficiency, at the inventory turnover period of 42 days, the company is nearly twice as efficient as state-linked giants and is nearly on par with world leaders McKesson and AmerisourceBergen, an impressive feat given the logistics challenge in emerging markets. The company’s9.6% ROA is nearly double that of state-linked leader. At EV/EBIT 10.1x, EV/EBBITDA 8.4x, PE14e 10.2x and P/Book 1.9x, the company is reasonably decent in valuations for its resilient earnings and cashflow growth. 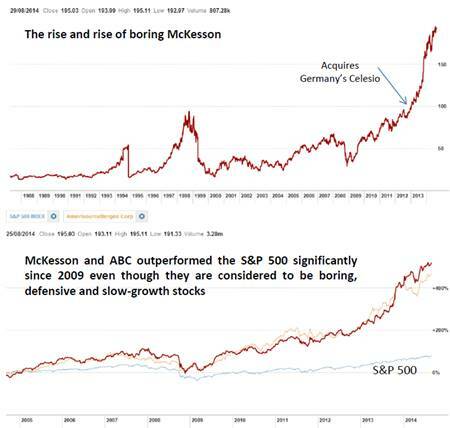 Giant drug dealers McKesson (MCK US, MV $44.4bn) and AmerisourceBergen (ABC, MV $17.4bn) are also on the global hunt for acquisition targets; McKesson has bought Germany’s Celesio, one of Europe’s largest drug distributors, for $5.4bn in 4Q13, to link up the supply chains of Europe and US; ABC has acquired a 19.9% stake in Brazilian drug wholesaler Profarma in March 2014 for $100m. More consolidation in the sector globally is likely and could be the catalyst to drive up the valuation of quality emerging market companies in the sector. Long-term downside protection in terminal value is provided by MNCs who will be interested to acquire or partner with the company to possess its valuable wide-moat advantage in its network of warehouses and wholesale-distribution know-how to reach the fragmented customers. The company has achieved an impressively consistent and improving performance in difficult times and is well-positioned in the local pharmaceutical industry which is among the few industries quite unaffected by economic cycles as the demand for drugs will continue even in difficult times. Public healthcare services in Asia face the problem of social and financial sustainability and the overcrowded public hospitals and clinics have sparked growing demand for reasonably-priced and quality private healthcare services, generic drugs and consumer healthcare products of which the company is a key provider and beneficiary.